Nature's Best has a great range of easy to use and effective clean-up products for cats. ​From stain and odour removers, to litter box deodorisers, the range will always keep your home smelling fresh! 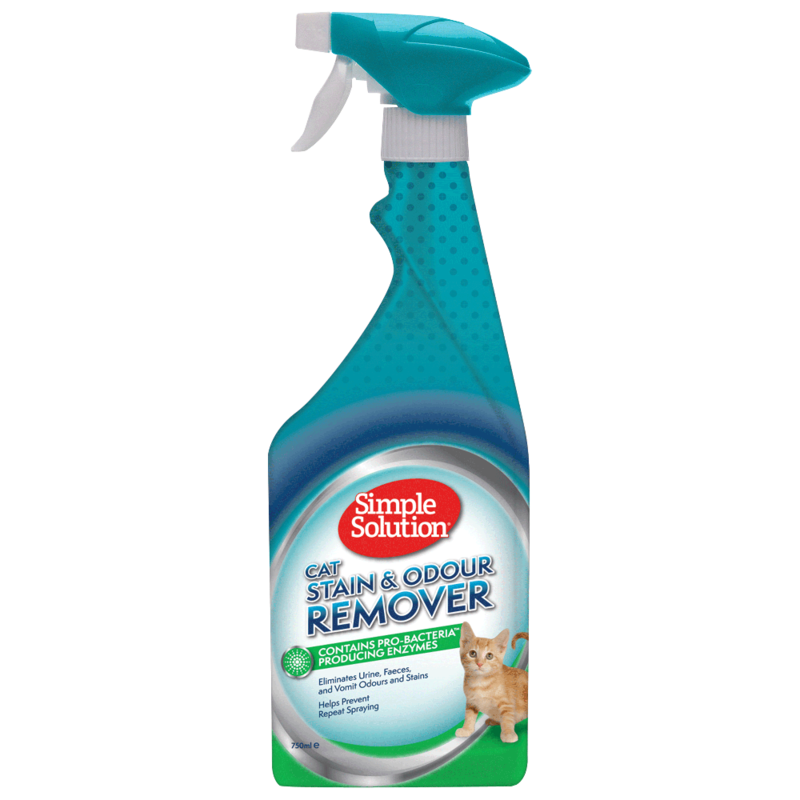 Simple Solution Cat Stain & Odour Remover (750ml) has been developed to use pro-bacteria and enzyme technology to effectively and hygienically remove organic pet and household stains. The formula has been specifically designed to clean mess from cats such as vomit, urine and faeces, and discourages repeat marking. Safe for use on carpets, upholstery, bedding, clothing and any other water-safe surface. 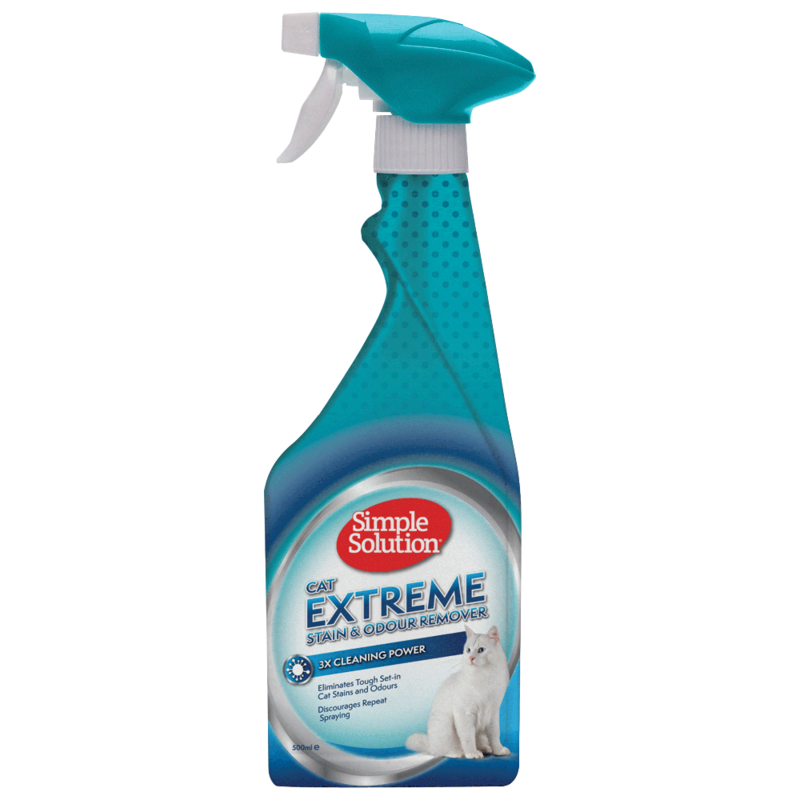 Simple Solution Cat Extreme Stain & Odour Remover (500ml) has been developed to use pro-bacteria and enzyme technology to effectively and hygienically remove organic pet and household stains. "Extreme" is the most powerful version containing three times more cleaning bacteria to work on the toughest of stains. This professional strength formula is designed to clean-up vomit, urine and faeces. Safe to use on carpets, upholstery, bedding, clothing and any other water-safe surfaces. 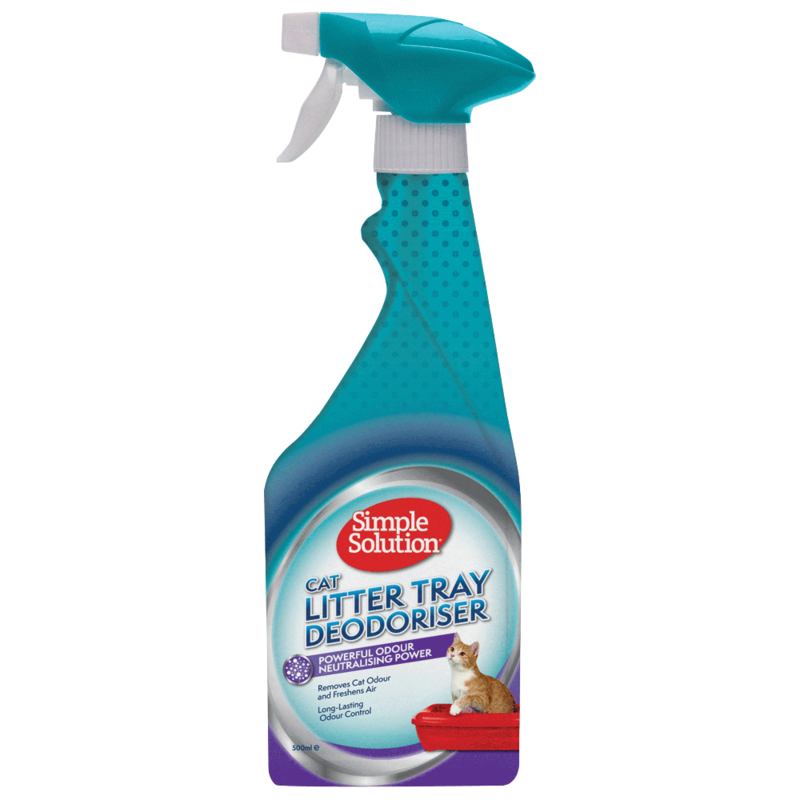 Simple Solution Cat Litter Tray Deodoriser (500ml) keeps your cat's litter tray smelling clean and fresh -- with over 40 treatments per bottle. The spray breaks down stuck-on urine and faeces, completely removing odours to ensure litter tray acceptance. The pro-bacteria formula digests odour causing residue to eliminate them completely. Clump-free spray formula makes it great for daily use. 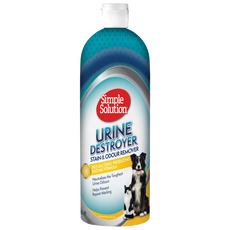 Simple Solution Urine Destroyer works uniquely to breakdown dried in stains. The formula acts to re-wet the area and then the bacteria and enzymes dissolve the stain. This gets the urine stains out permanently, removing the urine smell once and for all -- not masking it! Safe to use on carpets, upholstery, hard surfaces, cement, and all other water-safe surfaces. 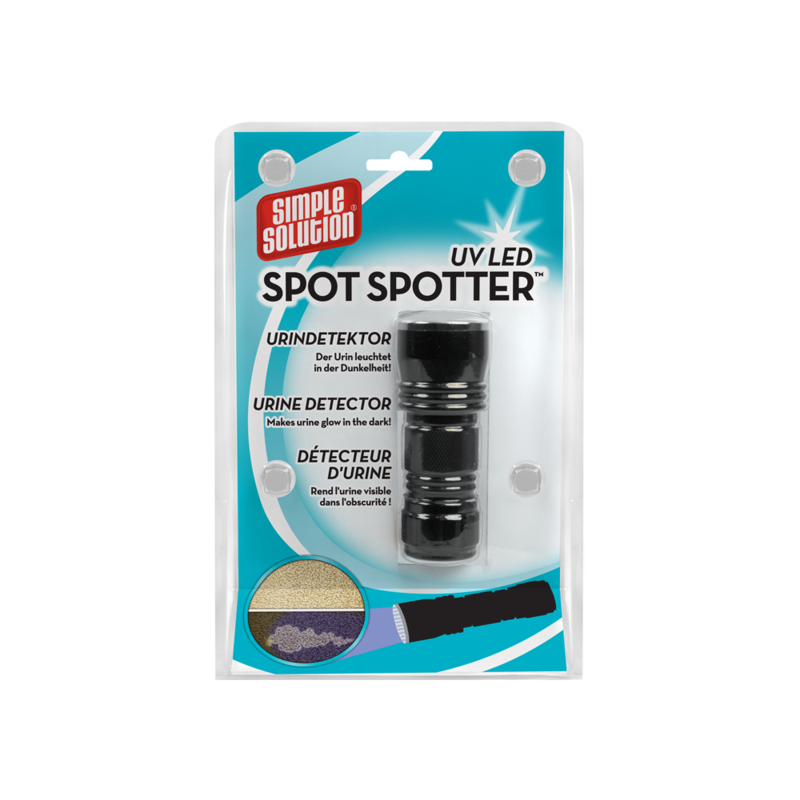 Simple Solution UV Spot Spotter is specifically designed to help you find urine stains that can cause strong odours when left untreated. The detector will work on both wet and older dry stains. For best results, darken the room as much as possible and switch off the lights. Use in conjunction with Simple Solution Stain & Odour Remover to complete eliminate all traces of urine stains and odours. 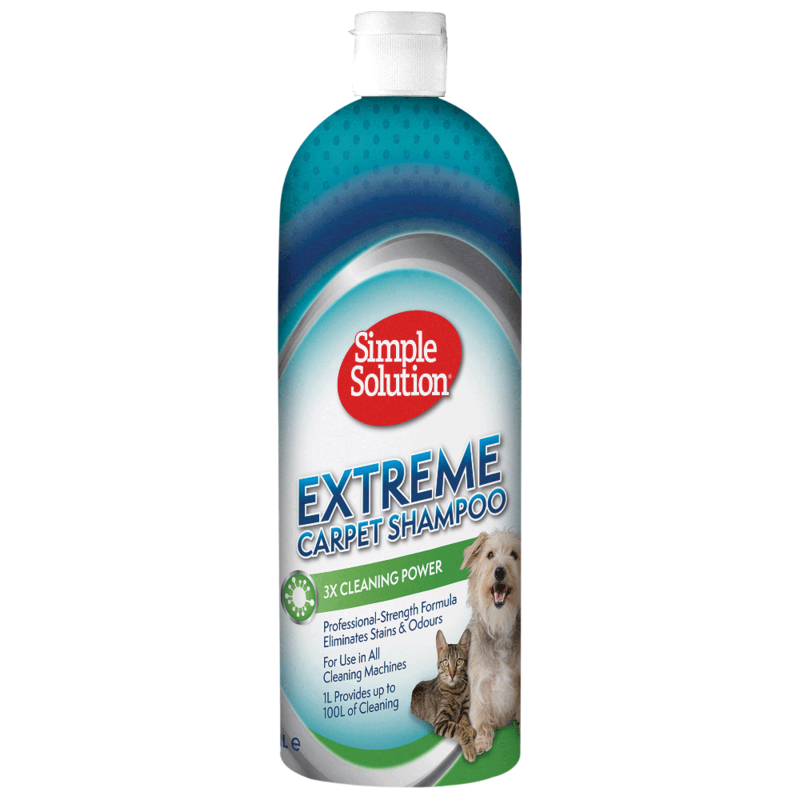 Simple Solution Extreme Carpet Shampoo (1L) is a professional strength, super concentrated carpet shampoo that removes stains and eliminates odours. Simply add to the water tank on your wet carpet cleaning machines and dilute as required. The powerful cleaning action removes stubborn pet stains and leaves the carpet smelling clean and fresh again. Can be used in all carpet cleaning machines. Simple Solution Multi-Surface Cleaner (750ml) has been developed to use pro-bacteria and enzyme technology to effectively and hygienically remove organic pet and household stains. Multi-Surface Cleaner works great on sealed hardwood floors, stone floors, linoleum, vinyl, brick, concrete, marble and ceramic tile.